In this age of special interest groups and untrustworthy politicians, how can we be really sure that the most vulnerable groups are being protected by the government? Who is advocating for the little guy? How can we be certain that everyone's rights are truly being protected? Specifically: who's looking out for all those drunken college students who want to recreationally torture one another with impunity? It's okay, everyone: rest easy. The Fraternity and Sorority Political Action Committee, affectionately referred to as the FratPAC, is here, and it's already apparently worked hard to stifle legislation meant to curtail hazing. After her 19-year-old son was fatally beaten as part of a fraternity hazing ritual, Lianne Kowiak started working with Rep. Frederica Wilson (D.-Fla.), who calls herself the "Haze Buster." Their joint goal was, purportedly, to introduce an anti-hazing bill to Congress. Wilson assured Kowiak that she would draft federal legislation meant to reduce hazing by would denying financial aid to students who engage in the practice and by establishing a federal anti-hazing advisory committee. What Kowiak didn’t know was that, behind the scenes, the fraternity industry's political arm, known as "FratPAC," had been pressing Wilson to back off. Today, 19 months after Wilson first promised an anti-hazing bill, she hasn't filed one. The industry’s lobbying is "disgusting," Kowiak said in an interview. "What are the priorities here?" They "should be to stop hazing so none of our youth have to go through it." The FratPAC has been around since 2006; it's raised between $300,000 and $500,000 for every election cycle since then. For the 2011-12 election cycle, the PAC raised $506,852. Among its donors were "executives from companies that fraternities and sororities hire to raise money for them; brokers from insurers that sell liability policies to Greek institutions; and lawyers who defend the groups in negligence and wrongful-death lawsuits." In short, a cool and totally scrupulous bunch of guys. According to the PAC's "About" page, the organization's goal is "to build a positive presence in Washington that helps to protect the fraternal experience we offer to our members." Unless you want to argue that forcing your members to roll in vomit and feces and coercing them to drink until they have alcohol poisoning is an integral part of the "fraternal experience," then maybe hazing shouldn't be your first concern? I don't know, man, just sayin'. According to Kevin O'Neill, executive director of FratPAC, the bill would unfairly target students on financial aid, which is fairly true. 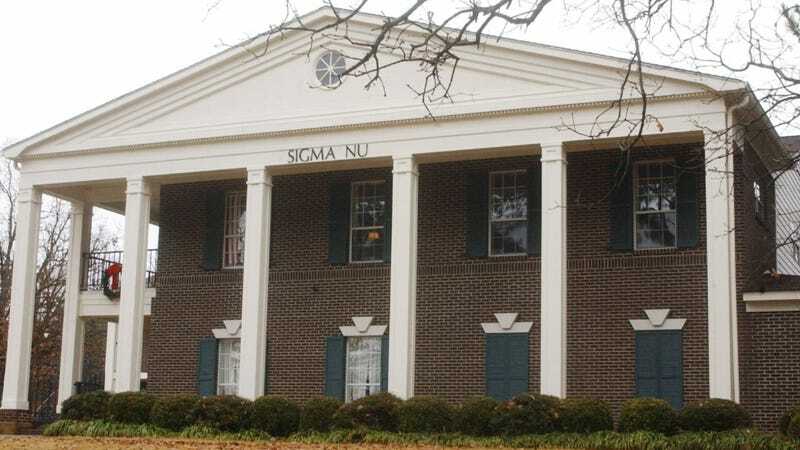 He also argues that frat members accused of hazing would "face a severe penalty for conduct well below the standard needed for criminal prosecution." From my understanding, though, abusing other students — even if it's all in the name of parties and beer and fraternal/sororal bonding! — would constitute criminal conduct, so, again, I don't know, man. When asked why she pulled back on the anti-hazing proposal, Wilson answered, "There are some hiccups in the bill in my mind as it relates to penalties," without elaborating. The bill, it would seem, is not the only one with hiccups (via fraternity and sorority members forcing pledges to get dangerously inebriated and facing no real punishment for it).